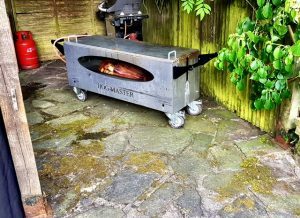 Hog Roast Waterloo – Hogmaster Hire for a 40th Wedding Anniversary! Siblings Harry and Rachel decided their parents needed a special treat to mark their 40th year of marriage and a big thank you from their children for managing to put up with each other for so long! So, they put their heads together to come up with a nice surprise that was a bit more imaginative than a soggy buffet and after some persuading from Harry, they decided hiring a hog roast would be the perfect way to celebrate their parents’ anniversary! With Rachel in charge of organising the guest list and sorting out the venue, Harry bravely volunteered to be chef for the evening. He wasn’t exactly confident in his culinary skills though (and neither was his sister for that matter! ), and he was worried he wouldn’t be able to pull it off. He felt a lot better after talking to us though, as we assured him how user friendly the Hogmaster is and how it does all the work for you, so Harry would be able to impress everyone without having to be sweating over a hot stove all night! Our friendly and efficient delivery team arrived at the venue bang on time and further put Harry’s mind as ease as they talked him through how to use the Hogmaster. He couldn’t believe how such a compact piece of equipment could cook up to 75kg of pork in one go! He certainly didn’t have to worry about running out of food during the anniversary party! When we returned to collect the Hogmaster after the event, we also had the pleasure of meeting Harry and Rachel’s parents who were overjoyed with the effort their children had gone to for them, and they couldn’t believe the quality of the meat the Hogmaster (and their son!) had produced! The siblings thanked us for our professional service and for providing them with such a great piece of equipment that made their parents’ evening extra special and kept everyone happy and well-fed all night! Harry said he will definitely be hiring the Hogmaster again in future, as it is so easy to use and has done wonders for his culinary reputation!